On the west coast of Florida, you will find two islands where there are so many things to do that you may never get to do them all. In days gone by, the two islands were one. Hogs were kept on the there, it being considered nothing more than wasteland. No bridges led to the island and few people visited it. Its name was Hog Island. Hog island has changed considerably since then but some things have remained the same. The number one thing that people have always remembered about the location is the white sand beaches. The sand is as soft as powder and the water glows turquoise when the sun shines brightly. In 1921, Hog Island was cut in half by a hurricane right through the middle of the island, washing away the soft sands with ease. The hurricane did its work so efficiently that the channel through the center of the island has remained to this day, almost a hundred years later. Subsequent generations attributed new names to the two island halves, most people living today oblivious to the fact that the two halves were once one. Even to this day, most of Hog Island is wilderness and wildlife abounds on the two halves. Visitors can now find long nature trails that pass by the foundations of buildings from a turn of the centry homestead and former park services buildings. Other trails give visitors glimpses of tall pine forests where large raptors such as great horned owls, ospreys, and bald eagles make their nests each year. 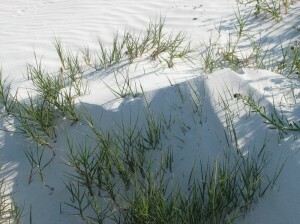 The northern half of Hog Island once had broad beaches of amazing white sand. 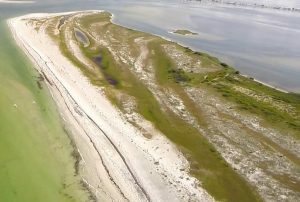 While some of the island still retains those beaches, the part of the island most used by tourists lost substantial amounts of its sand from storms during the last decade, proving once again that the barrier islands are forever on the move. While the northern half of Hog Island is accessible by a causeway, the southern half is accessible by boat. A ferry runs between the two islands, allowing visitors access to the more remote southern half. The two islands are well known to boaters of all types. The pass between the halves of Hog Island is a much-needed thoroughfare for fishing boats and the access to the islands by kayak is a favorite route in the area. In addition, the southern half of Hog Island has kayak trails that wind through the mangroves for one of the most amazing kayak outings you will ever experience. Fishing from either island or from the causeway to the northern end of Hog Island is a never-ending affair, providing some of the best shore fishing in the region. Despite being mostly wilderness, the two halves of the island have become famous recreations destinations. 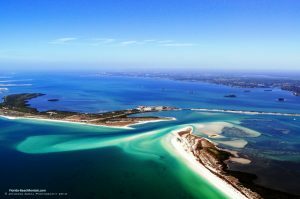 If you have read this blog often enough, or if you know the area of the central west coast of Florida well, then you might already know the modern names of the two islands created from Hog Island. They are state parks in the present and sit just north of one of the most famous beaches in Florida. When the name of Hog Island faded with time, new names were adopted. In the present day, the northern half of the island is now known as Honeymoon Island State Park. 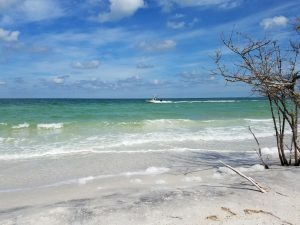 The southern half is Caladesi Island State Park, both islands situated just to the north of Clearwater Beach, Florida. If you are interested in visiting beautiful barrier islands with white sand beaches, these two should rank high on your list. The islands provide nature trails for wildlife enthusiasts, beautiful waterways for boaters, perfect shorelines for fishing, and gorgeous white sand beaches for everyone else who loves sun, sand, and fun. The next time you are in the Tampa Bay area, be sure not to miss these two island gems on the Florida West Coast.